Submitted by reynard61 on July 8, 2013 - 7:48pm. Submitted by NickMcWilliam on July 8, 2013 - 10:14pm. Yay! Swords are awesome. I haven't seen you around the school recently, glad to hear you're keeping up with it! Submitted by Nick Sandman on July 8, 2013 - 10:20pm. Huh.. could someone explain this exchange for me? Australian here and the way we do it is "Can I try this on?" then they say "Sure, over there". Sometimes you get a token saying how many items you have with you. Never been asked my name/sport. Submitted by Jam on July 9, 2013 - 8:45am. DRev below is correct, this is a lululemon store, that's just part of their brand identity, I guess! They are all about active lifestyle. Submitted by S'toon on July 8, 2013 - 10:40pm. What store asks you for your name and sport to use the changing rooms? How is my name and sport anyone's business if I want to see if something fits? Oh, I see Nick has the same question and he's not even in the same country or even continent as us. Submitted by KrystaVixen on July 9, 2013 - 12:19am. Bonus points if you convinced him that was all one activity. No, no. 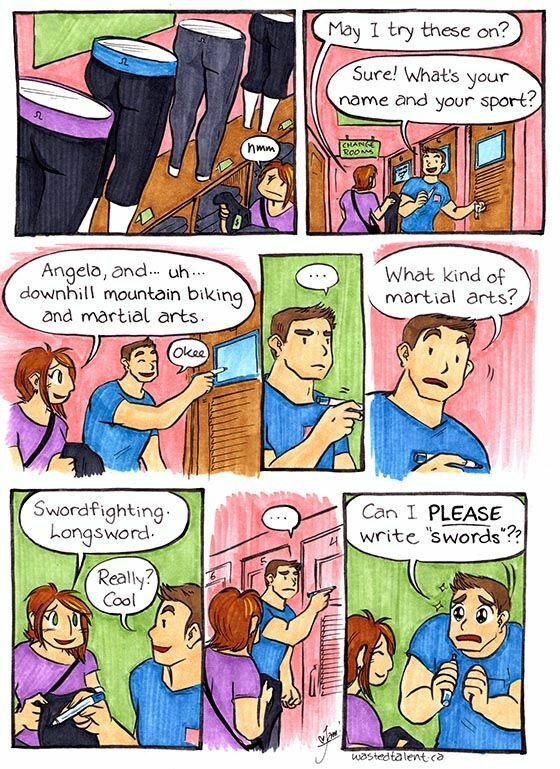 That's "Downhill Bicycle Longsword Battles!" Submitted by DRev22 on July 9, 2013 - 3:30am. Having been to the stores myself, and guessing from the brand Jam put on there, that's a lululemon store. Great fitness store, but I can't afford half of it. They ask you for your name and what sport you're shopping for so that they can get a better idea of what to bring you or make conversation. Submitted by Jam on July 9, 2013 - 8:48am. Yeah no kidding! I only caved and went back because the pair of pants I've been wearing for years have STILL held up really well. Submitted by Gdornan on July 22, 2013 - 1:57am. Go to the outlet store :D It suddenly becomes somewhat affordable. And yeah they hold up really well still wearing my stuff from 2006! Submitted by Starblast16 on January 5, 2015 - 9:32am. I'd love to learn how to use a sword! I'm more into short swords and Longswords. You wouldn't see me use a Rapier unless I had no other choice.